(CNN) -- Paris St Germain will part company with coach Paul Le Guen when his contract expires at the end of the campaign, the French club said on Tuesday. Le Guen's future was the subject of speculation following a weekend meeting with the PSG club president. Le Guen's final fixture in charge will be on May 30 when Monaco visit the Parc des Princes. "Paris St Germain announce today the club's decision not to renew, after three years of collaboration, the contract of its coach Paul Le Guen, which comes to an end on June 30, 2009," said a Web site statement. "The name of his successor will be made public in the next few weeks. 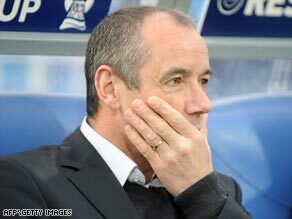 Paul Le Guen will continue in his role until the end of his contract." There has been mounting speculation regarding Le Guen's future since he met with PSG president Sebastien Bazin after the 1-0 defeat to Rennes. French daily L'Equipe claimed Le Guen was told that he would have no say regarding the club's future structure or their next assistant coach, and that transfer funds would be cut. With the former Rangers and Lyon manager unwilling to accept those demands, according to L'Equipe, a split appeared inevitable. The statement continued: "This decision has been made at this stage in the season because Paris St Germain are starting their preparations for next season. "Paris St Germain would like to salute the dedication of Paul Le Guen and his work as coach for almost three years. "Paul Le Guen has been able to steer the ship in difficult periods and give Paris St Germain back some ambition that allows them to figure today among the leading French clubs. "This ambition will stay intact for the rest of the season and the seasons to come." PSG are currently fourth in Ligue 1, a point behind third-placed Lyon with four rounds of fixtures remaining, and have a good chance of claiming a Champions League place. Antoine Kombouare, the current coach of Valenciennes and former PSG player, has been floated as a possible replacement for Le Guen.